After not running at Riddlesdown parkrun since New Year's Day, I finally managed to resist the urge to continue touring and paid a visit to my parkrun home. There is something special about being at your home venue. We were greeted with smiles and questions on the theme of 'where the hell have you been?' - All in good nature of course. I love buggy running (with our baby jogger 2) and today was an opportunity to do so on a dry(ish) Riddlesdown course - bringing my total number of buggy parkruns at Riddlesdown to four (and six buggy-running parkruns in total). 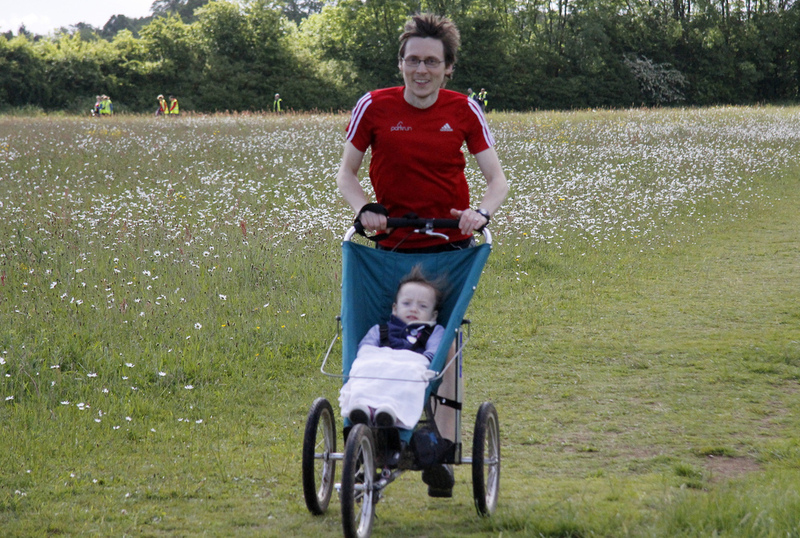 I would have loved to have attempted a new buggy running course personal best, but I needed to take things easy as I would be cycling from London to Brighton the following day and didn't want to risk doing anything silly. We hung around at the back of the pack during the run briefing and slowly followed the rest of the runners into a fairly strong headwind across the downs. It's always fun running with the buggy as people tend to react as you reach and pass them - mostly with a comment asking if there's room for one more on-board! For any new readers that are not familiar with the venue, I would direct you to the course description that I wrote for the parkrunfans blog. It's a really nice course and I really recommend that you give it a try if you haven't already. Post-run I had a vague plan to pop across to Banstead parkrun to watch the end-of-year presentations as Jo Q had just won their women's annual points prize - congratulations Jo. Sadly time was not on my side and we were still standing on the downs recovering and chatting at 10am. The Horseshoe, cake and talk of the next day's bike ride to Brighton all followed. Sadly, as with all good things, it had to come to an end and we jumped back in the car to Central London. The touring resumes for the next three weeks. If everything goes to plan I would like to tick a few more North London venues off the list. Gladstone parkrunners are having their first birthday party on the last weekend in June so I plan to visit them on that day. I'd like to visit Oak Hill, Grovelands and settle some unfinished business at Highbury Fields* in the near future so I'll work on those ones next. If anyone feels like joining me, please let me know. I am due back at Riddlesdown on 13 July to celebrate the two year anniversary, which will include watching the end-of-year presentations and I'm pretty sure there will be a slice of cake or two. Why don't you put it in your diary and pay Riddlesdown parkrun a visit! I imagine it'll be another buggy run, I might even have a stab at beating the buggy running personal best (currently 26:39 from event 72). *I have run at Highbury Fields but it was a special event and is recorded as a bespoke parkrun (event #3) (as much as I love having the bespoke parkrun on my log, I would like Highbury Fields to be properly represented, hence the unfinished business).